While some of the changes we’re after in our horses and ourselves will require time and commitment, today I wanted to lighten the load a bit and share a LONG list of “quick tips” that have the power to turn a less than stellar run into a winning one, in a literal instant. For moments when you need extra stability (ex. in the alley) place your feet at the inner edge of your stirrup branch so your toes turn out. In your general riding or when you want very precise leg placement for advanced communication, place your feet more near the outer edge to keep them straight. Do you ever feel out of sync with your horse when he blasts to the first barrel? Engage your abdominals by drawing your belly button up and toward your spine for more stability. Clear your throat to feel your abs engage – see how long you can hold this position (but keep breathing) to practice engaging these muscles! Tend to lose your stirrups or get behind the action in a run? Shorten your stirrups so the bottom touches just underneath your “ankle knobble” for a more athletic riding position. If you’re getting popped up often in a run, try lengthening them a hole. Does your horse fight or resist when you try to guide him for and through the turns? Shorten your reins even more before a run so you can be quicker and smoother, with less chance for delayed or abrupt communication caused by excess slack. Always lengthen them immediately after to avoid your horse getting dull from constant contact. Do you ever get dash-boarded when your horse makes a quick move or stop? Remember to keep your heels down (like your digging them into the dirt), and your chin and eyes UP, which will keep your keister DOWN in the saddle. Do you lean to the inside of a turn? Sometimes we subconsciously drive a “wedge of weight” here to prevent our horses from crowding. Correct your horse in slow work, and focus on overweighting the outside stirrup (for a while) in a run to reroute both your habits! Do you ride with excessive or erratic hand motion? Is it because your horse isn’t responsible for his job and you’re constantly feeling the need to correct? Or is it a subconscious attempt to balance your body (think balance beam)? Either way, fix the source and the symptom will resolve. Got five riding problems you’re trying to fix all at once? DON’T! There’s only time to react in a run, not think. Don’t give yourself more than ONE thing at a time (two at most) to think about and correct in a run. For a more balanced and powerful ride (less shoulder dropping/hind end disengagement) think about keeping your hat brim level (your crown from slipping), your elbows level (as if you were carrying a tray), your seat bones and your feet even. Be conscious of it and watch and feel as your horse’s athleticism blossoms! When adding speed, get responsiveness, respect and connection (control) well-established first. 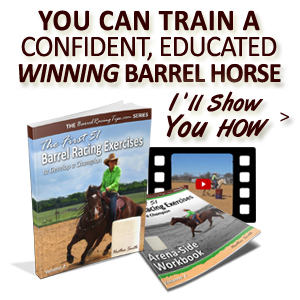 Then ease up to more speed gradually over time to build your horse’s confidence. Never ask for more than you can bring (rein) back in or they can learn to get emotional AND to push against and through pressure (which is dangerous!). Even though we’re only judged on our time in barrel racing, we owe it to our horses to be even, balanced riders. Poor riding damages muscles and even bones, crippling horses. Unsound horses can be actually brought back to soundness with GOOD riding! Do the horses you love (and your barrel racing) a favor by raising your awareness, focusing on improving, and REALLY implementing these tips for better riding. Purchase and mount a sliding mirror closet door (around $100 at any Home Improvement store) to your arena fence to easily and regularly analyze your riding and your horse’s position. Don’t be fooled by what may feel like really nice bend. Often our horses are only bending through their neck but not their entire body, or they are crossing over behind, but not really stretching on the outside (which is what we want – true, full-body bend) – watch and feel for it, then correct as needed. It’s common in barrel racers to have one seat bone that rides further forward than the other. At a lope, one will be further forward, but notice this at the trot for example and correct (over exaggerate the other way) as necessary. Does your horse really drop into the turns or get heavy on his front end? Where are your eyes going? Pick a point on the side of the arena to focus on, or look between his ears (like a windshield), not down toward the ground or at a barrel. Whatever a horse is doing, the rider is probably doing too – look closely, be responsible, self-aware and adjust as necessary. Does your horse lean into his circles? Be conscious of your own shoulders – are they even and elevated? Can you lift them to ask your horse to lift his? Many horses will mirror our bodies to a degree (even without specific training to do so) – take this to the next level by teaching them that your body position has meaning (don’t ignore it)! A horse loses “balance” when they place too much weight on the inside front leg through a turn (like a table tipping over on the corner)… to regain/reteach balanced weight (4-wheel drive) for more power, think about how you can ask the horse to place more weight on the outside hind. Horses are MUCH less likely to become unbalanced if we first, are keeping OUR own belts, shoulders, eyes level with the horizon. At a walk and lope, your hands should move with your horse’s head nod, but at the trot stay still. A horse’s mouth is the most sensitive part of their body (push your triceps/elbows forward slightly), to you get in harmony with their rhythm, and they’ll become much more calm, relaxed and less stressed. Raising our hands and arms may inspire our horses to elevate their front end, but be careful – it can elevate our body out of the saddle and result in a much less secure seat. For added stability, try to keep your hands and arms low. Pulling your inside rein to your belly button is used for “emergency stops” because it disengages the hind quarters. We want hind end engagement in our barrel turns, so avoid pulling toward your belly button or at an extreme angle across your horse’s neck. At advanced stages of engagement on a circle, there is little to no hind leg crossover (there will be some at the start of a barrel turn and less at the finish of a turn). Prop your iPhone on a fence post and video yourself – how small of a forward circle can you make without your horse crossing over behind? Try using more outside rein and less inside (you may have too much flexion) for more engagement. Instead of focusing on lift, lift, lifting a horse’s inside shoulder – focus instead on engaging and weighting, or “pushing in” the horse’s outside front leg. If the inside is too heavy, the outside is too light. Also think about getting the outside hind leg to “sit” and carry more weight. For better circles and turns instead of “bend,” think about S-T-R-E-T-C-H-I-N-G the outside of your horse’s body vs. crunching a horse on the inside (this will improve stride extension on a straight line too! ), which tends to bind/wad them up an inhibit athleticism. On circles (the exception) it’s OK to have your INSIDE leg a bit forward of straight shoulder/hip/heel alignment (and your OUTSIDE leg a tiny bit behind) which helps your horse bend. Think you’ve got great circles? Ride your horse on a circle holding one end of a lunge line while a friend holds the other – keep soft, even tension as you go around. 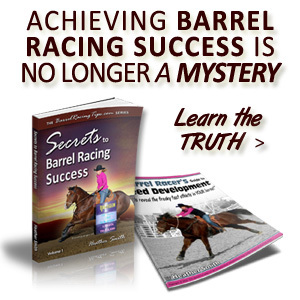 Remember – barrel racing requires PERFECT circles! A horse on a circle is bound to fall in if they’re moving lethargically (kinda how a slow-moving bike wobbles back and forth). Impulsion is necessary for quality movement. Think “springy” and animated – like an IMPala! To judge the quality of your lope and length of stride, look at how far the inside hind foot comes forward? Under the horse’s hip? Under their stifle, to the rider’s foot or all the way to the cinch? Another way to look at it – is how far apart are the horse’s hocks (from the side)? For even more precise communication with your legs (while keeping your feet straight and correct) think about turning your spurs/heels OUT instead of your toes in, which allows for more stability and mobility in your body. When trying to correct your own riding habits (especially in a run), experiment with focusing ONLY on keeping your hat brim level and nothing else. This has a huge effect on the balance and evenness of the rest of the body. Bringing our rein hand out away from our horse in a turn helps bring their nose around. In young horses or those who are new to the pattern, you might bring your hand out further than you would on an advanced horse who doesn’t require as much guidance. Leading the nose can be helpful for a horse who is stiff in the turns… however, don’t bring your hand out so far that you lean. Study, study, study your photos and video – after reading this list, what do you notice about your riding and position – what’s your game plan to improve it? To encourage a horse to extend their stride in a circle, tap/bump them subtly with your outside leg right at the moment when their outside leg is forward and their “arm pit” is most open. Keep in mind that horses will tend to “get under” which ever side you’re weighting most in the saddle. You can put more weight in your outside stirrup to help balance a horse who has lost their 4-wheel drive. When a rider leans to the inside, the horse is likely to also! A true horseman has hands that close slowly and open quickly. This is part of having “FEEL.” Even when we make a fast move, we can do it smoothly. Remember pressure motivates and release teaches, but neither do anything without good timing. Before you do ANYTHING on a horse, make any kind of transition in direction, gait, etc. get your body ready and organized first. Get your molecules “in formation” – your posture, life and energy, as a way to “prepare the position for the transition.” Horses can sense these subtleties! When you stand at the posting trot, which side does your belly button point to? If it’s pointing just slightly one way or another, you’re twisting. Aim for straightness on both diagonals. There are times when putting more weight in a stirrup is helpful (for example, turning) but many of us ride with our bodies crooked and weighted unevenly without realizing it. Get two bathroom scales, stand normally with a foot on each one and have someone check the numbers (don’t look down). What do you think this unevenness leads to in your horses or your runs? Is your horse engaged or heavy on the front end? Not sure? Ask yourself – what feels heavier, the front feet or the back feet? How can you adjust your riding position to help your horse put more weight on the back end? A horse is always heavier on the front end at a gallop – this is why we need to counter act this with lots of work on collection and engagement in our day to day riding and slow work! If you’re going to ask your horse to sprint, lift the LIFE in your body as if YOU were going to sprint, and only THEN use your legs (don’t just ambush with no warning)! It happens in a flash but a split second of preparation is all your horse needs to respond even more quickly and athletically. Horse won’t stop? In a desperate situation, bring one rein hand to your belly button (keep your eyes up & heels down) and add the outside rein if necessary to get under control. From then on, don’t put yourself and others in danger. Do whatever it takes in the moment to stay safe then go back to basics to fix the problem at home and gradually in exhibitions, etc. Even when you must be firm, you can always be fair. It’s OK to be firm with a horse when they commit a major mistake, just make sure that you deliver discipline (not punishment) the instant it occurs so they mentally connect it to the behavior and understand. If they get worried or emotional with the correction, restore emotional balance & relaxation before moving on. Is your horse distracted? Get the inside ear! Ride in a hula-hoop size circle until your horse puts one ear back toward you, then release and allow some freedom. If you have an ear, you have their mind. Set yourself up for success by “asking for the ear (their attention),” then asking for more of what you want – only when you have an ear. Lose the ear? Turn into a small circle again and repeat as necessary. Need to fix a horse that falls on the forehand in circle? Use your inside rein for flexion as usual, but offer a ‘soft feel’ of contact with the outside rein to keep them “stood up” and break the cycle/habit. Go back and forth correcting/rewarding and putting them on their honor so they learn to carry themselves correctly. Is your horse too stiff and straight in a turn? Look at your elbows. The more bend in your own elbow, the more bend your horse will tend to have through his body (the same goes for bit mouthpieces). Avoid a straight/locked arm position to inspire more soft, supple flexion in your horse. When we bring our hand way out away from our horse in a turn, our inside shoulder often goes with it – causing our horse to also drop their shoulder. Adjust your reins so that you can keep your elbow bent, and try shifting a little more weight to the outside for a more balanced turn. Are you turning with your inside shoulder first? 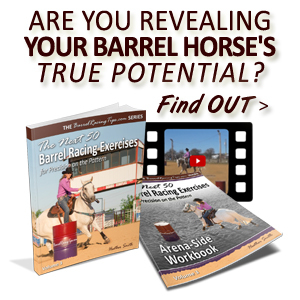 Is your horse also anticipating, dropping in, shouldering and tipping barrels? Keep YOUR inside shoulder back and rotate your outside shoulder around to crank the turns with more elevated, correct and efficient positioning. To test and improve your security and balance through the heel, foot and leg, stand straight up (no leaning forward) in the stirrups (there should be a 1/2 – 1″ gap or two finger space between your crotch and the saddle). Start at a halt or walk to get a feel for it or hold the horn at first to steady yourself. Then progress to keeping this position at the trot for as long as you can – up to 10 minutes. Implement this for 30 days – standing UP helps teach your body to stay DOWN! “Heels down” isn’t just a fancy equitation rule for sitting pretty – it’s incredibly important for staying on! Make sure your stirrups are adjusted properly (if you have trouble keeping heels down, they likely need to be shorter) and stand, stand, stand (see previous tip) to teach your heels to go down. With lots of focus on becoming a more solid, secure and balanced rider – remember that on the straight aways at high speeds, that of course we WILL get forward, up and over our horses and our seat will be lighter… it’s important that this position doesn’t spill over too much however, into our every day riding. We spend a relatively small amount of time at a full gallop compared to all the hours of training and conditioning where we and our horses benefit most from correct riding (which doesn’t include leaning forward)! Once you’re competent at standing in the saddle for extended periods at a trot, do the same with one arm absolutely straight in the air. It will feel strange but holding this position has the power to fix heels that are up, poor posture, etc. Put one hand under a seat bone at the walk – what does it feel like? How does changing the position of your pelvis change or improve what your horse’s back is experiencing? Avoid the bind! Do you find yourself or your horse going to extremes with body position and flexion to fix problems? Although you may need to exaggerate to teach or correct a habit, the ‘perfect form’ for athleticism requires straightness with only subtle bend. If you’re over flexing in one area, it’s likely your horse is resistant, stiff, or dull in another – fix the cause and the symptom will resolve. We want even weight in the saddle, with engaged hindquarters and an elevated front end. Depending on your results – determine which adjustments to rein position may be helpful! Never underestimate the “vision aid.” Wherever it is you want to go, make a conscious effort to LOOK there and allow your shoulders, torso, hips and legs to follow and watch/feel as your horse follows too (works best if you have good impulsion first)! Try this with a friend: Get in a stance that feels secure and try to pull each other over by the arm. Now stand with your head up, chest up, elbows bent, thumbs up, and feet straight then try again. NOW how stable are you? How does this translate to your riding? Analyze your riding position – if the horse under you were to disappear and you landed on the ground? Would you fall forward, topple backward, or be on your feet like stacked building blocks with shoulder, hip, heel vertical alignment? Thigh angle should be 45 degrees – about half way between vertical and horizontal which gives the rider the best opportunity to find and maintain shoulder, hip, heel alignment. Sit on your hands with your palms up with the intent to feel your seat bones. Experiment with tipping your pelvis forward and back as you round and hollow your back to find your neutral spine sweet spot. Now consider what would feel good to your horse – what is inviting for him to lift his back to achieve an athletic, collected hover-craft posture? When you become aware of your seat bones and how they affect your horse’s back, you may realize that all these years you’ve been painfully stabbing your horse due to your pelvis being unbalanced or out of position. Sit on your hands and FEEL it – then be motivated to prevent stress, pain an injury to your horse (most of us need to ‘tuck our pockets’ more)! If one seat bone is heavier, the other is lighter. This is the beginning of tipping sideways – yikes! Look at photos – is your belt level? When it is, your shoulders (and most everything else) will be too. Notice your shoulders in circles especially. When your shoulders are square and even your horse is more likely to move “square” (not lean) and your arms will naturally hang with your elbows close to your body. Avoid weak or “broken” wrists. Keep a straight line from your elbow to the reins. The straighter and cleaner your “lines” are, the better communication and signals get from you to the horse. Have soft eyes, especially in tense, high energy situations. Keep a wide peripheral vision, using your eyes as a tool for awareness. Let your body feel like jelly. Breath into your belly (don’t inflate your chest). Breathe all the way to your center then into your arms and feet and out the top of your head – let your whole body breath. Practice this rhythmic, slow breathing especially before a run to dissolve tension and you’ll find it easier to keep a relaxed, low center of gravity. Imagine “dropping your anchor” from your tailbone like a doll weighted at the bottom for greater stability. Do you tend to ride with more weight in one stirrup vs. the other? Drop (kick free) of that over weighted stirrup for 10 minutes each ride. Also imagine siphoning weight from one side to the other. Spread your toes in your boots to help evenness. Still fighting the “dropped shoulder?” Ride circles with your own inside arm raised high and reaching for the sky with your thumb pointing backwards. 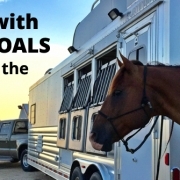 Give your horse a rest when you feel him make a positive change inspired by your position. Have ‘hands of steel in velvet gloves.’ Pretend there are baby birds in your hand – you don’t want to squish them but you do want to protect them and not let them fly away. To slow and relax an impulsive lope, get in rhythm with the horses circular pattern of motion then instead of going with it, intentionally slow down the motion of your seat to create ‘drag.’ Your horse is likely to match you – reward him when he does! For more oneness with your horse – imagine that you share a common skin, or that his legs are your legs – he should go the direction your body is riding, with a level of energy that matches yours. If you’re riding with low energy and your horse is going (even walking) impulsively – he’s running away with you! For you horse to be mentally connected to you, YOU must be mentally connected to him. Be present in the moment and focus, focus, FOCUS! Save some mental bandwidth to really concentrate for the duration of your ride. If you’re exhausted, consider it a no-brainer “conditioning ride” (don’t attempt intense training on that day). For a more stable, grounded seat – imagine your upper body filled with wet sand as it dries and runs down your lower body. Visualize ice cream or molasses melting down over your horse onto the ground. Instead of tensing your legs and pinching with your knees, practice pinching your “cheeks” to open your pelvis. To transition upward in gait, imagine shooting rainbows, fireworks or laser beams out your center (just below your belly button). Find your balance point by squatting on the ground to achieve shoulder/hip/heel alignment, then jump up and down to fine tune – where do you have to be to stay balanced? Keep an open mind – any changes you make will feel VERY uncomfortable at first! Remember – just because it feels wrong initially, doesn’t mean it’s not right. Just because a position feels comfortable, doesn’t mean it’s right! To encourage engagement in your horse, “tuck your pockets” to pull your pelvis to your ribs and pull your belly button to your spine (think Michael Jackson’s groin grabbing move). When sitting on your horse at a halt (feet out of the stirrups), lean far forward at the waist, then gradually sit back noticing the exact spot where you feel totally balanced without support from your legs – this is your balance point. Repeat at a walk. Memorize this spot. Get intimate with this balance point, test and check yourself regularly. 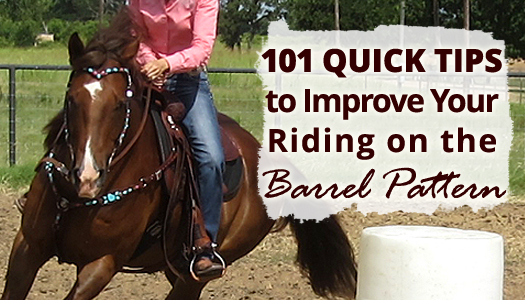 It’s usually about half way between your tail bone and seat bone (crotch) when sitting on your horse (as barrel racers you will likely feel like you’re leaning too far back, because we tend to lean forward – which is OK, when moving AT SPEED)! Also make sure your saddle isn’t too far forward, which makes horses “front-endy”! At a walk or trot, experiment with letting your horse’s body move your pelvis. Then consciously pedal your pelvis in smaller circular motions – does your horse’s stride change? What about if you pedal in bigger circular motions with your pelvis? Do you tend hurry, override or get up out of the saddle before the turn is finished? Instead, “pump your seat” to hustle through the turns for a longer, faster stride! At a trot test your balance by posting one beat, then staying up in the stirrups for two beats, then posting one beat, etc. Does your horse’s motion slam you back down in the saddle or are you in control of your body? Can you pick up the correct diagonal as you transition from a walk to a trot? Practice feeling your horse’s footfall and stride and picking up the correct diagonal with your eyes closed, then look down to check yourself (don’t cheat!). Punch half holes in your stirrup leathers for very specific adjustment. Use a hammer with large hole punch kit (available online from Tandy leather) or have your local saddle shop punch the holes so you can make specific adjustments. 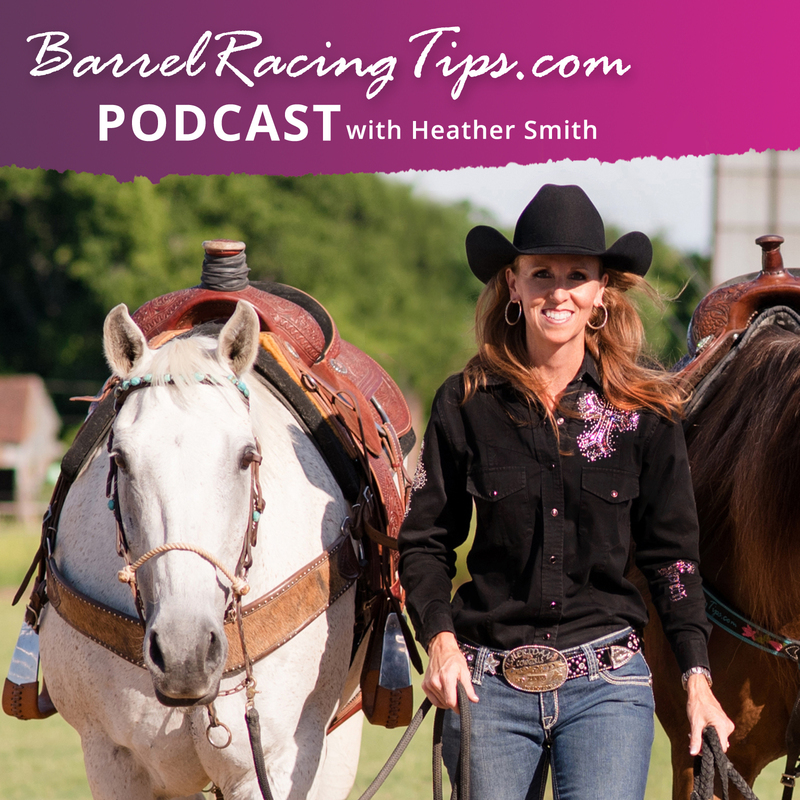 Remember barrel races are won and lost, lives are changed by 100ths of a second – tiny adjustments in stirrup length, rein length, etc. are critical! Ride to music in time with the beat. Can you increase your horse’s head nod (bigger steps) or lessen it (smaller steps) to the same music? How does this relate to the shortening that must happen in preparation for each turn? If your heels tend to come up, you may have too much weight in your seat and not enough in your feet. Imagine standing on the ground and LIFTING your toes, this works better than thinking “heels down” which can cause you to push the stirrups forward. When rising up in the posting trot, try to stay UP as long as possible. 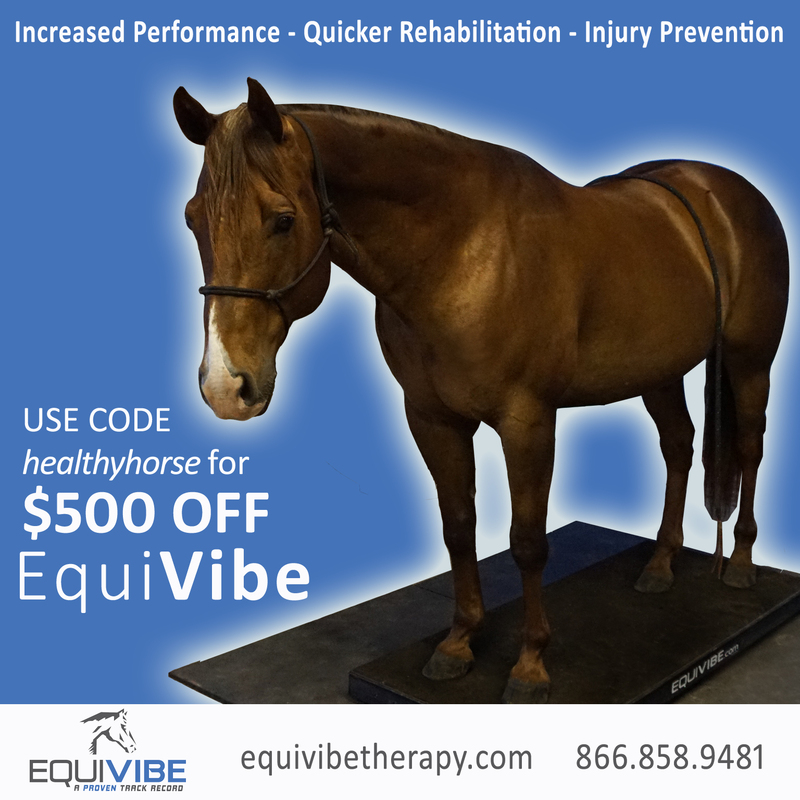 It will help your horse move more freely with a longer, deeper reaching stride. When rising this trot, avoid rising too high. Keep your lower leg and knee in the same place (bent as if there’s a bolt through your knees). Your horse gives you the UP, you just move forward. Eyes up, eyes up, eyes UP! When you change direction, or especially on circles place your focus further out ahead of you rather than immediately in front (which draws our attention down). If you often feel behind your horse’s movement, consciously practice riding with more energy and life in your body to match your horse’s energy for more harmony. Is it me or my horse? Is your horse responsible? Can you release the reins for a few strides without your horse changing anything? If not, you may be using the reins to micromanage! Can you change direction while your horse stays in the same rhythm? Test yourself! Most of us overuse some joints in our body and under use others. When we don’t use our WHOLE BODY to move, our horse’s whole body will be compromised as well. Start loosening up by “oiling” (stretching and loosening) your ankles – over exaggerate the movement to the point of pedaling the stirrups. Take this idea and move through your whole body, becoming aware of what’s “stuck” to loosen up and achieve a new level of fluidity, balance and harmony. Resist the temptation to ride with your biceps (advanced communication does NOT require strength or leverage). To ride with finesse pull your arm pits down and push forward slightly with your triceps instead for more harmony with your horse’s movement. Barrel racing requires PERFECT circles and STRAIGHT lines. Draw patterns on the ground with flour and test yourself to see how well you really can circle and stay straight (a straight horse is a POWERFUL horse!). Just DO it – you’ll be challenged, surprised, humbled – and a much better rider! The ability to ride with our horses vs. on them isn’t a talent that some riders just have, and some don’t. 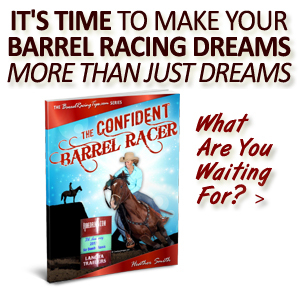 We can ALL intentionally become better barrel racing jockeys. But it doesn’t happen by accident – it happens on purpose. Remember – a good rider is part of their horse and can enhance their movement and not get in the way of it. I was pretty far along in my barrel racing journey before I understood what really made a great jockey, and my own efforts to be better continue each and every day. It doesn’t matter how long we’ve been riding or how much we’ve accomplished – there is always room to improve. I hope the list above opens your eyes AND all your senses to feeling and experiencing the next level of excellence, both on the barrel pattern and off. When we focus on riding with harmony and becoming one with our horses – they will be happier and healthier, they’ll stay sounder, longer, perform better and we’ll enjoy faster times and bigger pay checks as a result! Click here to download a printer-friendly list of these Quick Riding Tips for quick reference in your barn or trailer. What “quick tips” would you add to this list? Please share in the comments below!